I have never been a person who likes large houses; I prefer to live in a small and cozy world. My way of thinking is that I don’t need any rooms not used on a daily basis. I can remember visiting various friends’ homes when I was younger and seeing rooms full of furniture covered in plastic. We weren’t allowed in those rooms as they were for special occasions and otherwise, there just to look at. I don’t need a room set aside for special occasions in my old house; I have one room that functions as a parlor, sitting room, family room, and living room all-in-one (at least I think it functions as a sitting room and parlor–I have never been sure what happens in a sitting room or parlor!) Yet, I’ve never felt I lacked for space. However, I know that small old houses aren’t for everyone, that some people like room to spread out and not feel crowded. If you are one of those people, you may be interested in an old house in Pennsylvania that is in need of some weekend preservation work. 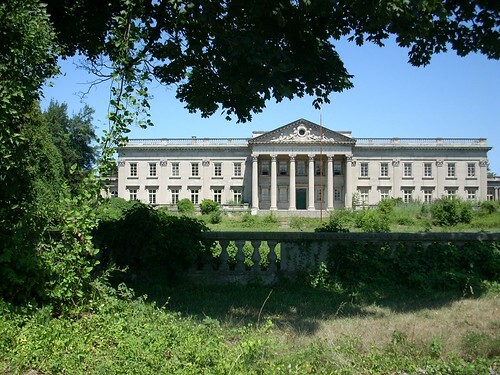 Lynnewood Hall, outside of Philadelphia, needs a person or organization to save it before it meets the same fate as White Marsh Hall, another old house nearby. Lynnewood Hall would be perfect for a growing family and with 70,000 square feet and 110 rooms you may even be able to squeeze in an in-law suite. The old house was built about 1900 by a butcher who started making his fortune selling meat to the Union Army during the Civil War. All kidding aside, I think the old house does deserve to be restored and used for something, although I’m not sure what. It would be way too big for a bed and breakfast unless they made really good blueberry waffles and developed a national following. There is a social media drive underway to contribute to the mansion’s preservation, much the same as the drive to save the old house in New York I mentioned in a previous post. for preservation just like any other historic homes. Unfortunately, the odds seem to be somewhat stacked against it due to the huge financial commitment the restoration and maintenance of a home this size could require. Lynnewood Hall may manage to beat the odds, though. There is an old mansion near the southern end of the Blue Ridge Parkway in Virginia that was facing the same fate after sitting empty at various times during its history, and a preservation minded owner finally stepped in and purchased it. I’ll have to say that Swannanoa is looking pretty good these days.